They’re top of the Liga Iberdrola and current reigning champions for the last two consecutive seasons. They were runners up in the Copa del la Reina last season (extra time loss to fierce rivals Barcelona) but have faced a tough exit in the Champions League to past winners & finalists Wolfsburg. 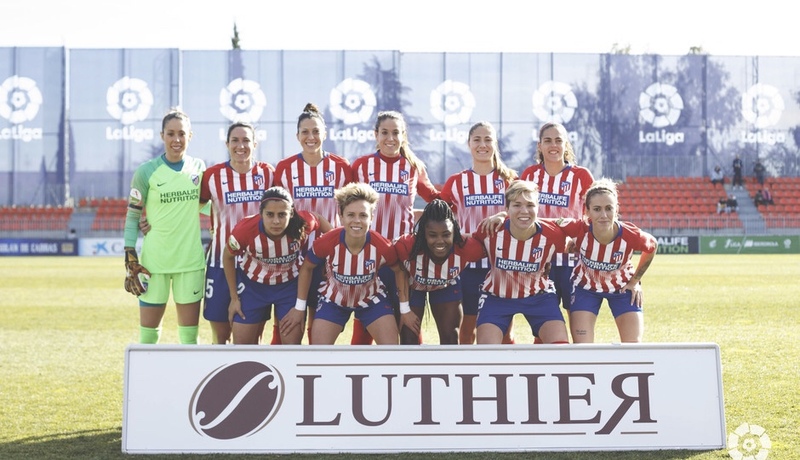 The club (Atlético de Madrid) has invested time and money in the Women’s side and infrastructure at all levels. And it has paid off. An impressive fact (although from Wikipedia & translated): Atlético de Madrid is a pioneer in the Community of Madrid, and one of the first in the country, to have exclusively Female teams in juvenile and junior categories, which means that they have to compete in male leagues against mixed teams or formed only by boys . 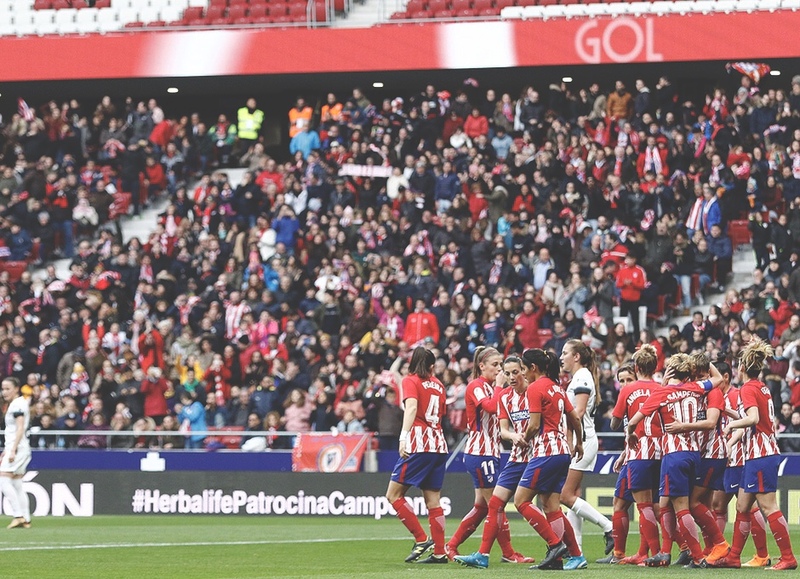 In the 2018/19 season the club had a total of 444 Female players. When they won the league last year, they had a bus to go along with the Men’s team in joint celebrations for their Europa cup win. Players from both teams are included in media duties to represent the club. 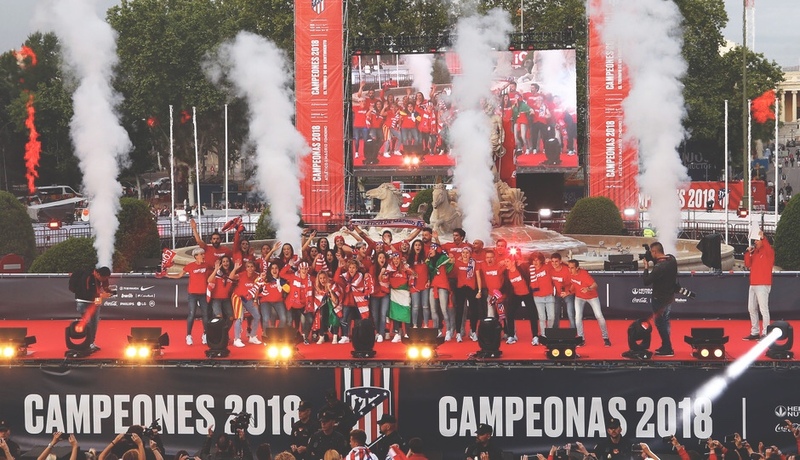 They played the 1st Women’s game at the new Wanda Metropolitano stadium last year and 22,202 fans turned up. The team is very well rounded in terms of experience and youth in regards to it’s players. 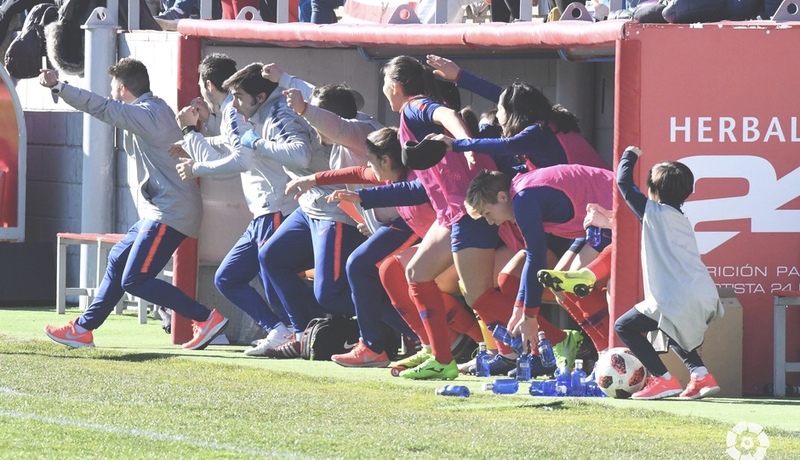 Captain Amanda Sampedro (M) came through the academy and along with goalkeeper Lola Gallardo, they’ll be the main voices you hear on the pitch. Both are Spanish National team players, and they’re joined by fellow Countrywomen Ángela Sosa (M), Olga Garcia (M), Silvia Meseguer (M), Jenni Hermoso (F), Andrea Falcón (M) and Esther González (F). The younger ‘Selección de España’ players include Carmen Menayo (D), Laia Aleixandri (D), Rosa Otermín (D), Ana Marcos (F) & María Isabel Rodríguez (G). Coming in from other countries are Kenti Robles (D) from Mexico, Elena Linari (D) from Italy, Aïssatou Tounkara (D) & Aurélie Kaci (M) from France, Dolores Silva (M) from Portugal, Alex Chidiac (M) from Australia, Viola Calligaris (D/M) & Jennifer Oehrli (G) from Switzerland and Ludmila Da Silva (F) from Brazil. Almost all of them have represented their nations at some level. In terms of standout performances this season so far; all have shown why they are there. Ludmila has one of the quickest sprints I’ve seen in a long time and is so dangerous on the counter. Laia & Menayo are the future of the team and marshall the defence so well for a young duo. Sampedro is already a legend at the club and continues to put in great performances. Jenni has returned to the club and scored 12 goals already. New signings Linari & Tounkara have settled in to the defence, Dolores Silva & Chidiac in the midfield and Olga Garcia in attack. The integration has been seamless. It’s my 2nd season going to the games as my season ticket for the club covers most of the teams here (Men’s, Women’s & the B team). 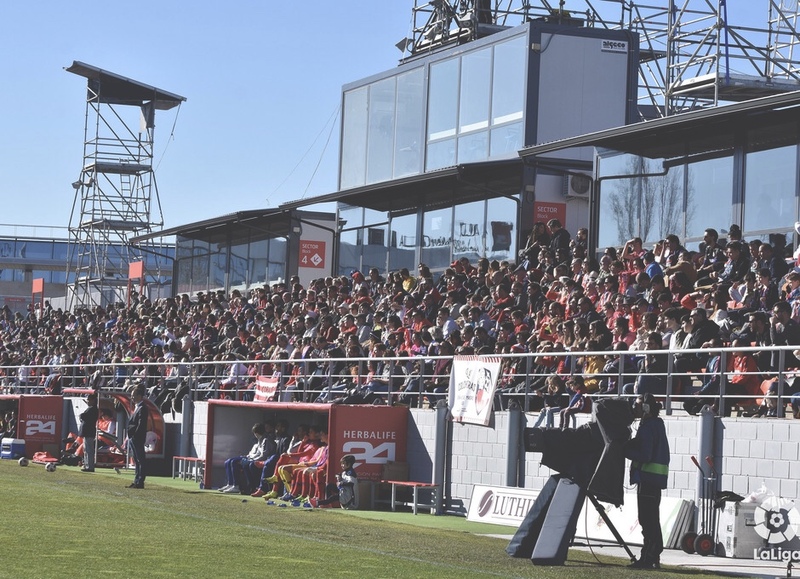 They play at Ciudad Deportiva Atlético de Madrid (Cerro del Espina), Atléti’s training facility, and also the home ground of Rayo Majadahonda in the 2nd division. Depending on how many supporters have season tickets, some games are busier than others due to clashes with the Men’s team. But the family aspect of the games is more apparent here. It’s €5-10 per game, children have more proximity to the players and the ball girls are allowed to have a kickabout on the pitch before the game. I’ve also seen a few of the substitutes join in with them at half time. At a game at the end of last year, a small boy was shouting “happy birthday” to Ludmila whenever she got near his section of the stands. It raised a smile from the player, who was indeed celebrating her birthday, and from everyone around the boy. His tiny voice reached across the pitch so clearly. After scoring the 5th goal, She later came up to meet some fans, take photos and collect gifts that were made for her. José Luis Sánchez Vera is the gaffer. It’s his 1st season as manager at the club. He’s carried over the formation of 4-2-3-1 as it’s worked well with the players they currently have and the one’s they’ve brought in this season. They do mix in a 4-4-2 from time to time as well. The team show the same grit and tenacity that is embodied through the ‘rojiblancos’ at all levels. Despite the champions league exit, they look on course to secure the league and cup double. As long as they can keep rivals Barcelona at bay. You can follow their progress on the official site, Instagram, Twitter, Facebook & YouTube.